It seems that the latest episode of Star Trek discovery has been a little polarizing to the shows fan base. Before we get into it there will be a lot of spoilers here because this episode begins to tie up a lot of loose ends from the previous few. So a spoiler warning has been given. To me there have been three running themes throughout the season the they weave in amongst themselves perfectly. The themes are of Mirroring, Politics and fate. It began with the Klingon’s and the Federation, two opposing factions with different world views, on one hand you have the inclusive federation that rule dominant because they bring together people from a variety of species in harmony, while the Klingon’s gain their strength from an isolationist, xenophobic and war like culture. On the other hand when we travel to the Mirror Universe the opposite applies. Though we do eventually find out that the ideals of tolerance and cooperation terrify the Empire, which is why all information from the USS Defiant was redacted or scrubbed. Which ties in with our modern politics, we tell ourselves narratives that make us feel like heroes, but one must wonder are we really who we say we are? That concept brings us to Tyler or should I say Voq. It has been pretty obvious for a while that Voq and Tyler where one in the same. Though now we find out just how far Voq went to loose himself. I am still not sure what his plan was, something tells me that it was a short term survive at all costs plan rather than infiltrate and bring down the federation kind of plan. 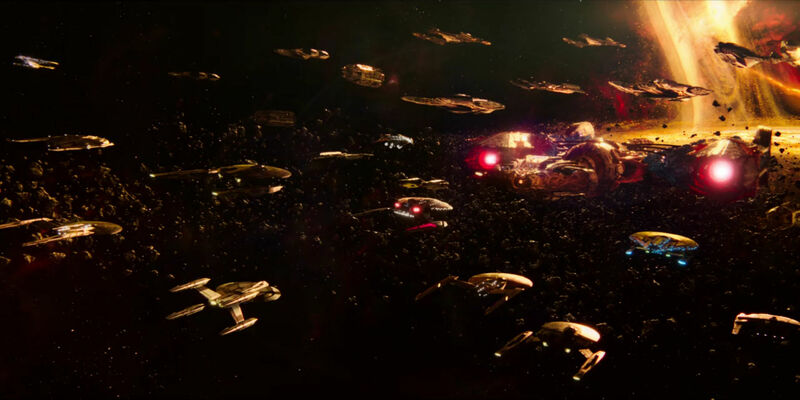 With L’Rell being the only one on the Discovery that can help Voq maybe they can return to their people and help broker a peace, who knows? The major question left here is what the hell happened to Tyler? 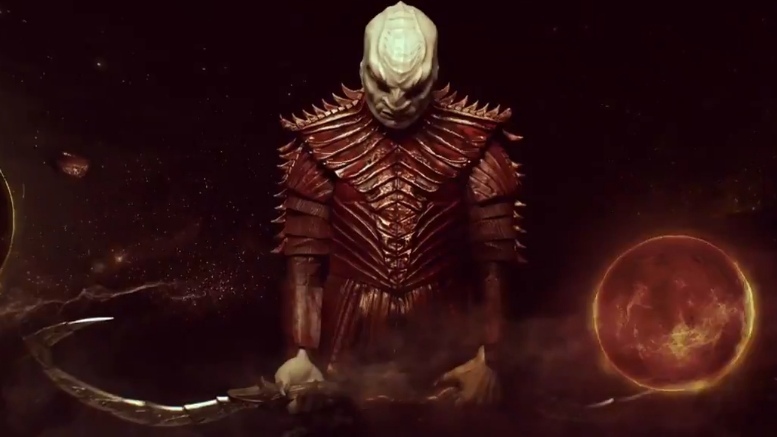 I know the original is obviously dead and suffered heavily at the hands of the Klingon’s but is there any of him left inside Voq, was he supposed to cross paths with Micheal and even then who fell in love with her Voq, Tyler or both. How did he cross over? What happened to the original Lorca? What does he actually think of his crew? And most importantly, this Lorca has a deep obsession with fate. We eventually find out that part of the reason he brought Micheal on board is his belief in fate and how it had bigger things for both of them. His affection for her is enough that he would cross a universe to be with her. Though a dampener is put on that when its mentioned that Mirror Lorca groomed her, but this is from mouth of the Emperor and her trust has not been earned yet. 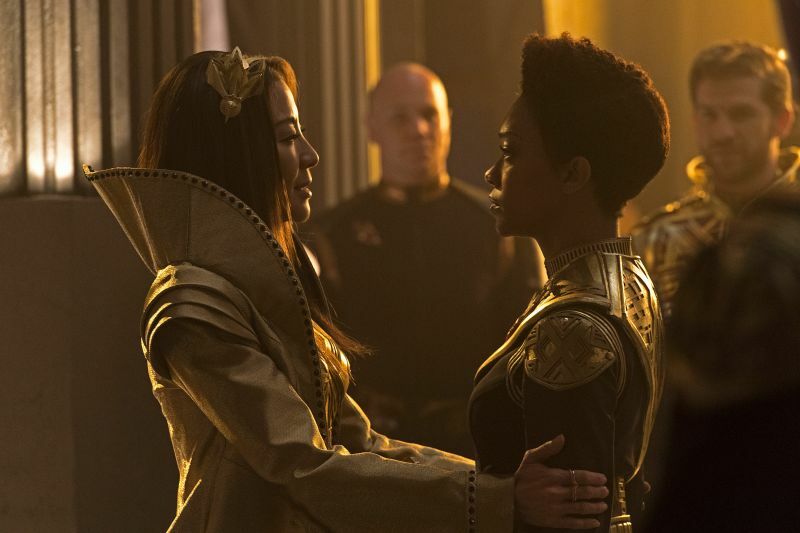 So did Lorca choose Burhman to use her to get close to the Emperor or because of his possible sick obsession, a possible third option could be he regrets loosing her and maybe saving this new Burhman is a way of redemption. As for her emperor right off the bat I will tell you this, she is not trustworthy and I am only saying that based on two things. She is evil – what evidence do we have for this, well all her titles, the fact that she executed all her adivisors, eating slaves and ruling over this militaristic evil empire are all evidence to prove that she is evil. But yes the Emperor is utterly terrifying and what makes her so brilliant. She is in complete control of herself and her emotions. She seems like she could kill you without even blinking, she is totally detached. Which is interesting because in the original universe she was warm and affectionate while Burnham was the cold distant one. Burnham after being forced to actually eat a slave is then forced to reveal herself to the Emperor and all details about the Spore Drive in order that she and her friends can survive. Only to find out after that Lorka is not who he says he is. As much as this episode was full of gut punches and big reveals, the most emotional moments of the episode came from Stamets little side quest. As much as I enjoyed seeing him interact with himself it was his interactions with Dr. Culber that utterly broke me. While in the network Stamets comes face to face with the fact that his lover is dead. There is one scene where they are alone together and Stamets asks the computer to play “that aria he loves and I hate”. That moment was just heart breaking. This scene was just beautiful and its important, this is a main stream show having two gay men discuss the most important parts of their days, the little things, the stuff that for some reason some people think are exclusively straight. I know that this episode has received flak for killing off a gay character but it does not mean that Stamets cant move on and find someone new. In the end for all the series faults it has had one emotional scene between these two characters and that was truly beautiful. In the future why does no one know about the mirror universe? Will the doctor be back within the spore network? What happened to the real Lorca? 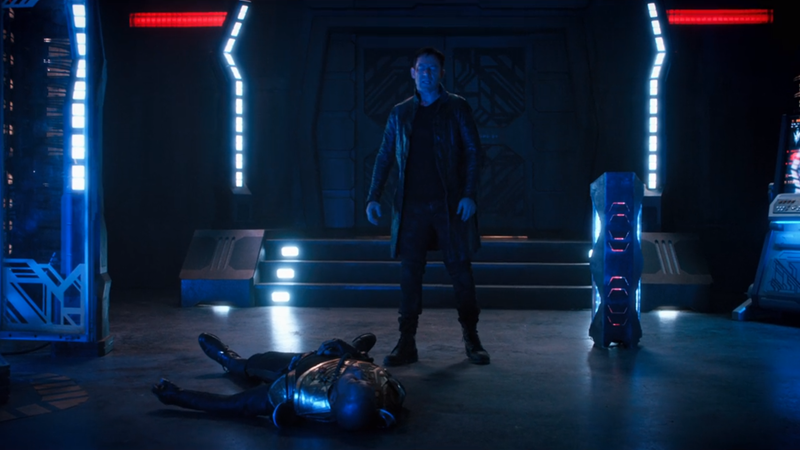 What is Lorca’s end game? What happened to Mirror Burnham? How does Spok end up serving the empire? Can the Emperor be trusted? Who will be Captain of the vessel if Lorca is gone? Is there a chance real Lorac is being held prisoner and will he return to captain his vessel? Is there any Tyler left? How will Burnham treat Voq?